I’ve spent the last few years in quest of more brilliant reflective color and luminosity in my paintings. About two years ago, I paired the most satisfactory combination of materials to date. Working Ampersand Art Supply’s Aquabord™ with Daniel Smith watercolors, I have achieved the deepest, richest color I have ever painted. Painting on the Aquabord surface in watercolor is a joy since the surface is responsive and cooperative. On the Aquabord surface, the watercolorist can easily accomplish many of the more difficult watercolor effects created on paper. This museum quality panel has the absorbency of the standard cold press paper, without its limitations. Moreover, the surface allows the artist to control washes and color, and when finished, present the painting without glass! There is a smooth surface similar to a hot press paper, but I prefer the textured surface of Aquabord. It works best for watercolors. One of the assets of Aquabord is the bright reflective quality of the white clay and the color that can be achieved on it. Previously, the watercolorist accepted a loss of brilliance in some colors as the pigment was absorbed into the depths of the paper. 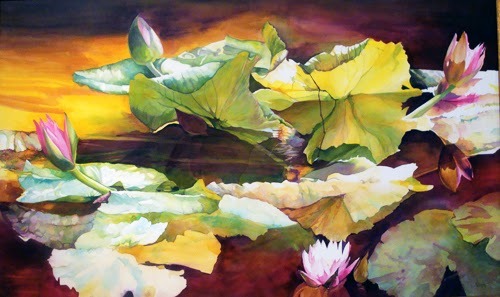 On Aquabord, the artist can create paintings of deep, radiant colors. This new surface allows the painter to create the softest washes, typical of those possible on cold press papers, as well as vibrant colors and textured patterns that are possible on hot press paper or bristle board. This fine art panel is also pH neutral and acid free. After drawing the design on the Aquabord, begin by painting lush pools of water on the surface. If the value of the color is to be dark, use wet color rather than clear water. It is not necessary to wash the entire surface of the board with water, but rather choose to work in smaller areas. When wet, the natural surface darkens to a light taupe. This value change easily allows the painter to know which areas are wet and which are dry as the work progresses. The bright white color of the clay returns when the board dries completely. Apply the water in thick splashy puddles, adding heavily pigmented color into the water as needed. With Aquabord, you need to work with your brush loaded up with pigment. Try not to go back into the wet area but allow color & water to drop down into the clay surface. Mix the color darker since the additional surface water will lighten the pigment value. A good, natural bristle, soft brush is useful for these applications. To achieve the best effect, keep the brush tip within the water layer rather than dragging it on the board’s surface. This application results in an even, flat, layer of color as the pigment settles on the board. The Aquabord surface has a subtle tooth that is evident in the finished work. The texture, however is finer than that of a rough or cold press paper, creating fewer shadows on the surface and brighter color. My palette consists of many colors. However, because I like working with the character of each pigment as it stays suspended in water, I will choose to use a pigment that will create the effect I want rather than manipulate the pigment, possibly destroying characteristics or color. A good example is created when Quinacridone Coral and Quinacridone Rose are richly mixed together and dropped onto the wet or damp surface. The two colors will move and separate, enhancing each other as the warmer red, Coral floats next to the cool red, Quinacridone Rose. Both pigments are transparent, intense colors of the same value and hue. Yet when mixed together, they create a subtle and sensuous transition that can only be achieved in this manner. Try the following exercise on a small piece of Aquabord. Draw a couple of leaves onto the board using a hard lead pencil. Wet the board so it is damp as explained earlier. Apply cool green colors to your drawing while the board is damp. Let the water and color absorb in the surface and reach a slow crawl. Then wash Cerulean Blue across the area. After drying for a short time drop Hansa Yellow we into wet, onto the areas that are to be lightened. See how the warm yellow pushes the blue back and brightens the leaf. Now lift wet color with a soft, mostly dry brush in order to regain the whites. As colors stack and the painting develops, return to areas and lift pigment. This allows altering of glazes, changing of values, and the creation of the desired textures and patterns. The surface of the Aquabord permits the careful lifting of layers of pigment value and hues to those colors below, bringing out sparkling underpainting for emphasis and contrast. Several tools can be used on Aquabord for lifting. A traditional round or flat nylon watercolor brush can be used. The nylon brush offers more resistance against the surface than a mixed bristle brush or a natural bristle brush. When more lift is required, a hog bristle acrylic may be used. Allowing the board to dry between each removal of color will offer a clear, more controlled lifting. You can also use tools such as sgraffito knives to cut into the surface and create sharp highlights such as on the edge of a petal. When the painting is complete and totally dry, seal the finished artwork with several layers of Krylon® UV Archival varnish or other final spray. Even though the pigments used may carry the highest permanency ratings, all artwork should be protected against the damaging effect of light and the pollutants in the atmosphere. First, spray the painting with two to three layers of varnish in order to seal the pigment and prevent it from moving. This is enough to protect the painting. However, for a more even finish, brush two to four layers of Golden Acrylic UV Filtering varnish on top of the sprayed varnish. This varnish come in a matte, satin or gloss finish and can be used according to individual preference. The complete artwork is framed much like a canvas might be without glass! I use silk liners on my paintings. I find the silk is more compatible with my style with a texture suited to water color. The liner provides the visual space around the painting much like that of a matted watercolor. Have fun experimenting.